This has been more than a 2 year test project and I am thrilled to say it actually worked! Over all I was surprised at how little effort and garden space garlic takes to grow here, aside from planting, harvesting and occasionally weeding our drizzly west coast climate seems to take care of the everything else. 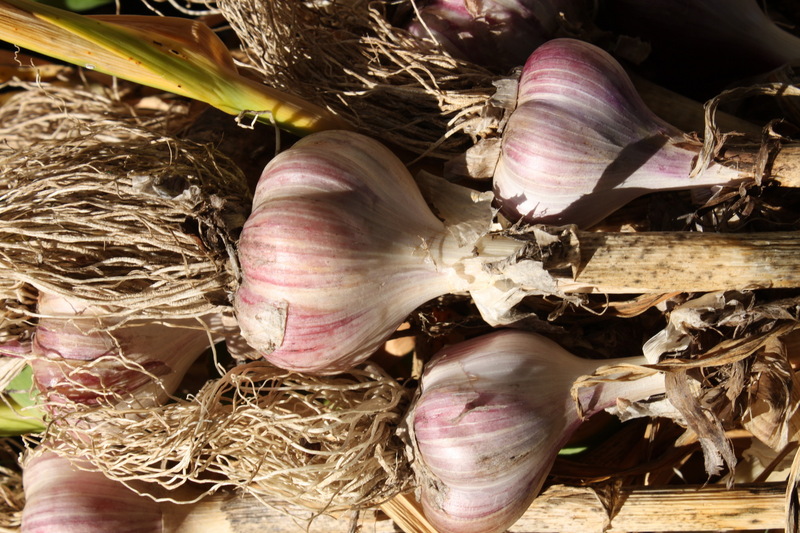 I have grown all my families garlic needs and replanted and grown my own seed garlic, it came up just as lovely as last year’s. My cured garlic from last year kept really well, I even have some left over that’s been “in storage” I use the term loosely because really by storage I mean hanging in the utility room stairway, it been over a year and it’s still perfectly good. My summer was so busy with work I missed a large portion of the garlic harvest, I had 75 garlic plants form bulbs but I only made it out to the garden in time to catch and cure 54 of them, the others had already dried up and the bulbs had decayed, it appears garlic does require some human intervention to reproduce from the bulb? I am only guessing out in the wild real world, garlic would have reproduced via it’s flower, which we domestic gardeners cut off at the scape stage to eat! I have heard from people who grow garlic from the flower, once it goes to seed it makes tons of mini garlic cloves, I planted a garlic flower last year mine just didn’t come to fruition probably due to the lack of water I know it sounds ridiculous but I didn’t even have time this summer to monitor the sprinkler on a timer. This entry was posted in edibles and tagged garlic. Bookmark the permalink. 2 Responses to Garlic Self Sufficient, it Worked.